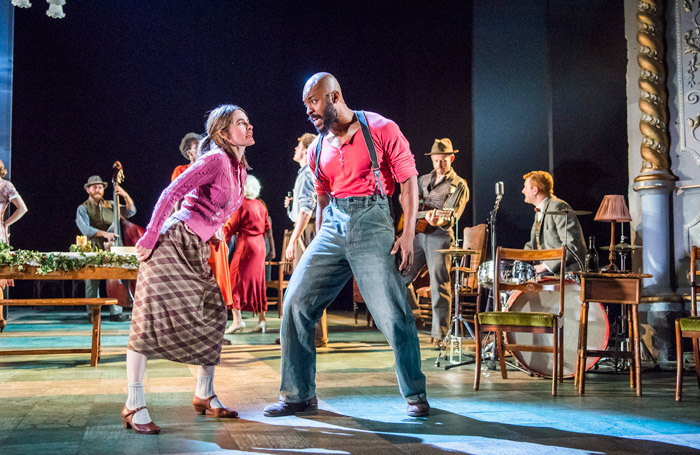 Girl from the North Country may have scored a slew of five star reviews during its Old Vic Theatre world premiere season, but on the West End stage it’s a case of The Emperor’s New Clothes, with the overwritten new musical looking decidedly underproduced. In writing Girl from the North Country, Conor McPherson had the very good fortune to be given full access to the treasured, extensive music catalogue of Bob Dylan. With no artistic input from Dylan, McPherson has fashioned an original work, a gritty play in which the drama is soothed by the beautiful music. Set in the Duluth, Minnesota (Dylan’s birthplace) at the height of America’s Great Depression, Girl from the North Country presents a cavalcade of characters residing at a run down boarding house, There are so many characters, in fact, that it takes the whole of act one (which runs an hour) to introduce them all; this first act is consists entirely of exposition, with no plot developments occurring until after interval. There is a strong sense of Our Town, particularly with the local doctor serving as celestial narrator. Much of the pathos lands affectingly in act two, but the characters remain little more than rough sketches, despite the considerable acting talents of the cast. In crafting this “play with songs,” McPherson’s decision to break all the rules of musical theatre is an artistic one; it is, however, jarring to have the songs performed by the actors, not the characters. 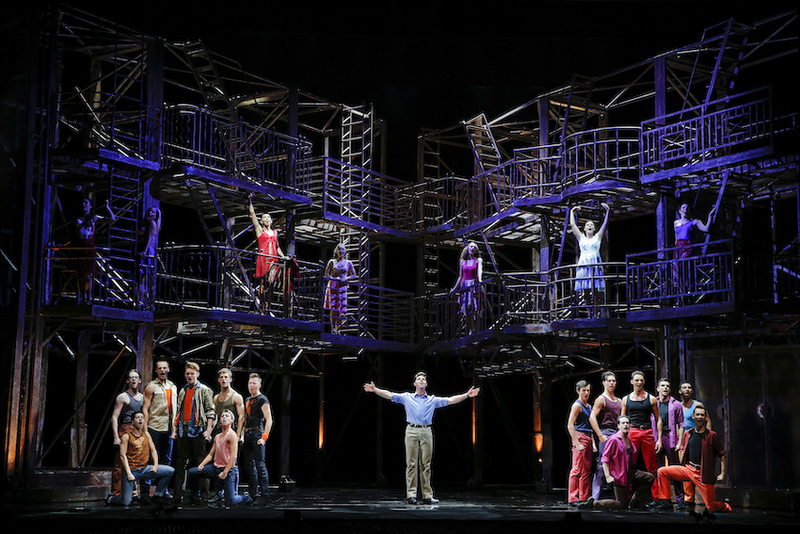 Completely removed from the storytelling, the songs are sung to the audience by actors gathered around microphones on stands. Despite misgivings about the style, it cannot be argued that the music is anything other exquisite. Drawing on compositions of Dylan’s from 1963 to 2012, Simon Hale as delivered truly beautiful vocal and instrumental arrangements that successfully add a heavenly atmosphere to the piece. Rae Smith’s scenic design appears to have been created with the budget of a high school production. Besides the use of a few small painted flats, the show is mostly performed in front of the theatre’s basic black cloths. Cast members carry chairs and tables on and off, and band members sit onstage around and about the action. Smith’s detailed costumes clearly evoke the period, and are a given a further sense of sepia tone with Mark Henderson’s excellent lighting design. Directing his own material, McPherson draws strong performances from the excellent cast, ensuring that the storytelling, slight though it is, lands with maximal impact. 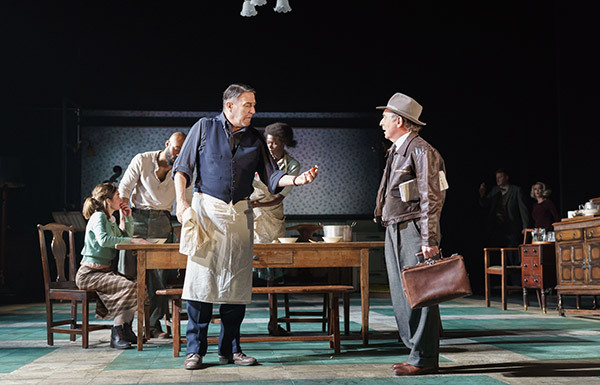 Ciarán Hinds’ soulful eyes project boarding house proprietor Nick Laine’s sorrow and strain. 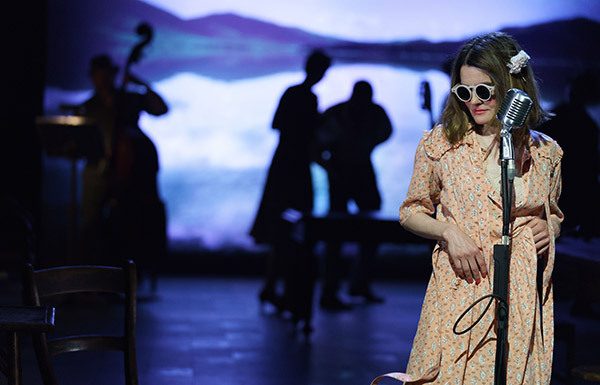 Shirley Henderson is a delight as Nick’s twitchy wife Elizabeth, a woman whose dementia has freed her from the constraints of polite behaviour. 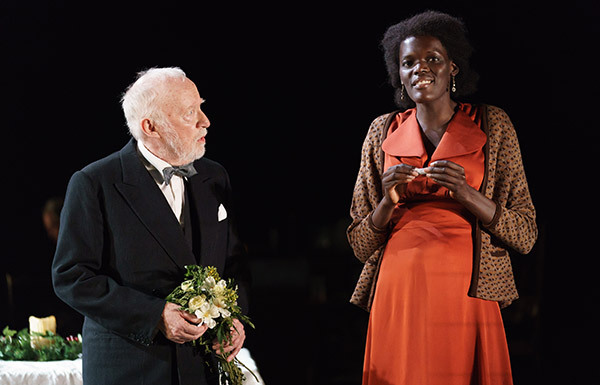 Sheila Atim brings an enigmatic presence to Nick’s adopted daughter Marianne, whose pregnancy derives from mysterious origins. Atim is well partnered by Arinzé Kene as wronged ex-convict Joe Scott. The gently affecting arc of this pair is central to the heart of the show. There are doubtless a good many theatregoers who will find Girl from the North Country charming. 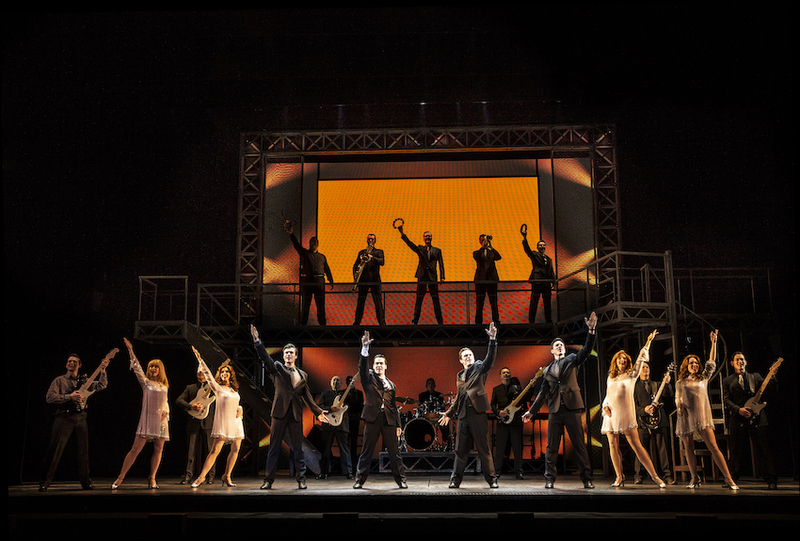 A further off-West End season may have been more appropriate for the show in its current form. 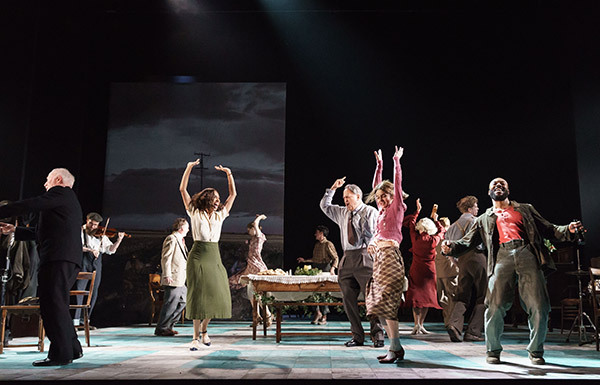 Girl from the North Country plays at Noël Coward Theatre, London until 24 March 2018. I saw this in the Old Vic and loved it. I have never seen anything in Noel Coward but It possibly sounds like a bit of putting Ladies in Black into the Regent after putting it into MTC and having a successful season. A very good comparison! Apart from the change of venue, I think I also had a problem with the mixture of music and drama. Looking back at the show as the weeks went by, I looked at it more fondly. It just wasn’t my type of show overall, but I could totally see how others could love it.